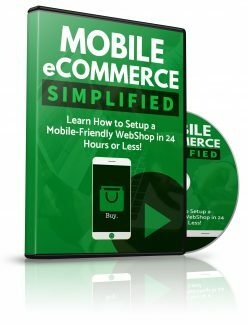 This mobile eCommerce video course explains how to create user-friendly, mobile optimized web stores in less than 24 hours. Today, more people than ever are shopping online using their mobile devices and the number is growing daily! This means that if you (or your client's) business is not optimized for mobile, money is being left on the table. This PLR video course will explain the different ways you can get your business off the ground quickly and easily while ensuring it is mobile friendly. You can watch the course and learn for yourself, or you can use it as a lead magnet (bribe) to capture targeted emails from online store owners or potential ecommerce entrepreneurs and then email them with your offers. This high quality lead magnet comes with a private label rights license, a professionally made squeeze page, a promotional video that will capture the attention of your visitors, and a full video which they will receive after they sign up to your email list. To use this course as your own, simply replace the opt-in form on the pre-made squeeze page with your own form from any autoresponder such as Aweber MailChimp and voila! You've got your own irresistible freebie to give away to build your list. Building an email list is one of the best ways to build a profitable home business and this plr course can do that job effectively.